Project Managers are always looking for short cuts, lessons learned from other projects that can help them with their current project. This following case study is taken from the www.lessons-from-history.com series whose mantra is "lessons from the past that assist the projects of today to shape the world of tomorrow." Many people today would not consider The Great Escape anything but a great war movie from the sixties let alone a real life event that actually happened, or even less so a project that embodies today's principals of project management. However, it warrants a second look as a project in its own class simply on the risks that were taken, the management of risk, and the lessons learned. How often do you come across a project were you are putting your life on the line with the outcome of a project. Whether knowingly or not, this is what happened in 1944. The Prisoners of War (POWs) were absolutely committed to a cause to continue a fight as prisoners and cause maximum havoc within the enemy's backyard. 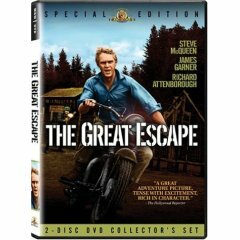 The film The Great Escape (1963) has had mixed blessings for the ex-POW's of Stalag Luft III. It certainly brought attention to the escape and captivated its audience with its humor and action but it takes poetic license with the escape. Most people will recollect the motorbike scene and Steve McQueen entangling in barbed wire fences in an attempt to break across the Swiss border, see Figure 1. But this is a very distorted view of the actual event because by 1944 the U.S. POWs had been segregated to a separate compound, and no motorbikes were ever used in the real escape. A train ride was the best transportation most escapees could hope for.